Does this seem a little unfair to anyone else? I mean, it is already a bear, a fairly fierce member of the animal kingdom, but on top of that it also knows kung-fu? Hopefully whatever twisted master passed on the secrets of martial arts to this bear paid for it dearly when the two faced off in a cage match during the Tekken tournament. In this video, Matt Mulholland, a musical genius from New Zealand, totally rocks out to Celine Dion’s “My Heart Will Go On”. But you should watch it anyway, because it is funny. If you watch carefully, you can see a man, who in a moment of terrified recognition, attempts to stop what is about to happen. Luckily for the world of viral videos, he failed. In this video filmed from the helmet cam of a motorcycle rider in Moscow, this soon-to-be organ donor decides that traffic is just for people that value life. 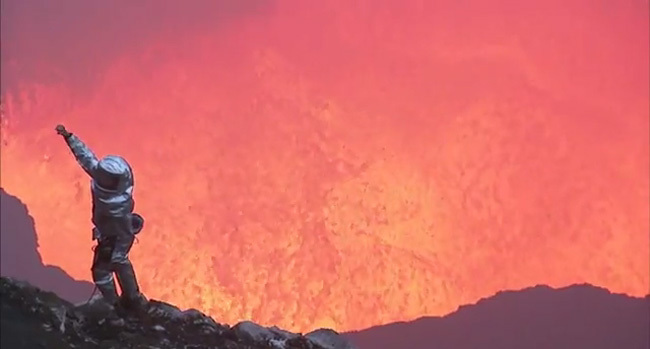 Volcanologist Geoff Mackley and his crew descended into a volcano on the Vanutan island of Ambrym and took this incredible footage. Keep in mind that despite Geoff’s casual attitude in the video, the lava that is dancing behind him is between 1,300 and 2,200 degrees Fahrenheit- hot enough to melt even the most advanced Terminator. Geoff and his crew spent some time arguing in the crater before Gollum finally arrived and bit the ring off his finger before falling into the lava, thus saving the world.